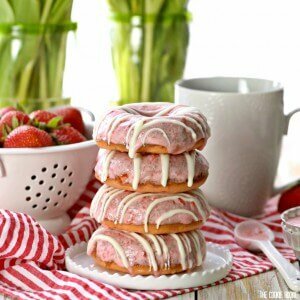 Strawberries and Cream Cake Mix Donuts are an easy quick breakfast that the entire family will love! I love using cake mix for donuts...makes them quick and easy and still full of flavor. This icing is amazing! In a large bowl, mix together cake mix, eggs, butter, and cream. Stir by hand until well combined. Pour batter into greased donut pan, making sure to not overfill. The donuts will rise quite a bit! Bake for approximately 8-10 minutes or until you can insert a toothpick and it come out clean. While donuts cool, make your glaze by combining powdered sugar, cream, and chopped strawberries in an electric mixer, beating until well combined. Make the glaze thicker or thinner by adding more or less cream. Dip each donut face down into the glaze and then allow to cool until the icing hardens a bit. It might not harden all the way because of the strawberries, but it will firm up quite a bit.